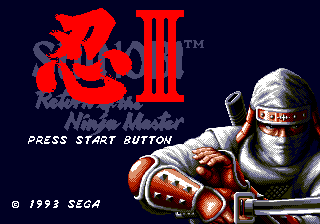 Shinobi III: Return of the Ninja Master, called The Super Shinobi II (ザ・スーパー忍II) in Japan, is an entry in the Shinobi Series of video games, and the direct sequel to 1989's The Revenge of Shinobi, called The Super Shinobi in Japan. It was released in 1993 exclusively for the Sega Mega Drive, though has since been included in many compilations and released as part of the Wii's Virtual Console service, as well as Steam and iOS. The iOS version is no longer available on iTunes as of 2015. Controls are virtually identical to The Revenge of Shinobi: jumps and pressing again at he peak of the jump performs a double jump, shoots a shuriken or attacks with the sword when close to an enemy or object, and performs a ninjutsu move selected from the pause menu. Every ninjutsu is carried from The Revenge of Shinobi with almost no changes in the function. Support for the Six Button Control Pad is only available by using a Cheat Code. Main article: Shinobi III: Return of the Ninja Master/Development. The PAL version was partially optimized to play the background music at the correct speed. However, gameplay is still slower compared to NTSC versions. Forcing the game into NTSC mode makes the music play too fast. The ASIA version is mostly identical to the japanese release, the only difference being the label on the back of the cartridge is in english. Main article: Shinobi III: Return of the Ninja Master/Comparisons. Main article: Shinobi III: Return of the Ninja Master/Changelog. Main article: Shinobi III: Return of the Ninja Master/Magazine articles.